Creating an advertisement for a job opening at your company can be a nerve-wracking experience. After all, the stakes are high when it comes to securing top talent, and competition for qualified applicants is tougher than it’s been in years. Quickening the pace of hiring remains a hot topic. Rightly so. The time it takes to fill a job grows year after year. Many ideas about faster hiring are focused on the employer. But what about jobseekers? Sustainable speed can only be achieved if both sides of the hiring equation are addressed. Employers looking to hire foreign employees into so-called “specialty occupations” through the H1-B visa program are required to notify certain domestic workers at the time, or within 30 days before, they file the Labor Condition Application (“LCA”) with the U.S. Department of Labor. At iRecruit we get many questions sent in by customers. We thought we would share some of the questions with you on our blog. 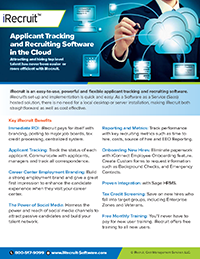 iConnect is an add-on module for iRecruit Applicant Tracking Software that allows you to communicate with candidates and new hires. iConnect eliminates (or vastly reduces) the paper-heavy aspect of hiring. With unemployment currently at four percent, it’s a candidate’s market. Because finding the perfect candidate has become more challenging, recruiters have started widening their pool of applicants by recruiting out of state. This is a great way to get a good diversity of skilled employees, but snagging a great out of state hire requires additional logistics and considerations. Here are five tips for elevating your applicant pool and effectively hiring out of state candidates. ? Before you continue reading, get ready to cringe — and maybe laugh at yourself. Because according to industry leader Stacy Zapar, every recruiter is guilty of at least some of the mistakes on this list. Yes, even her. The quest to keep employees happy has spurred some employers to take a fast-fashion approach to perks, making cupcakes, or kombucha, or onsite CrossFit classes a must-have for some time—until the next big extraordinary benefit arrives. At the end of 2018, the number of open jobs in the U.S. reached 7.3 million, according to the Bureau of Labor Statistics. That’s the highest number of job openings on record since the Department of Labor started measuring them in 2000. Available jobs have outpaced hiring for more than a year, indicating that companies are having a difficult time filling their vacant positions. You might think that once a candidate has signed their offer letter, the salary inquiries are over. But even after you’ve sorted out starting salary, you can bet that pay is still going to be on their minds. In a day and age with more information than ever, employees expect transparency around salary not just at the beginning of their tenure with an employer, but at every step. iRecruit is a cloud-based recruiting and applicant tracking and electronic onboarding software designed to provide any size of business a cost effective, affordable and truly simple way to manage the recruiting and onboarding process online. With options for Express, Professional and Enterprise, you can find a flexible recruiting and onboarding solution that works for your budget, and meets your needs. Join us for a demo or ask a question. ← Employer Ghosting Survey Results: Have You Ever Been Ghosted by a Candidate or New Hire?